timber portal frame span limitation? Portal frames are often difficult to achieve with timber, especially if you are attempting to use traditional joinery. Wood joinery typically has no rotational resistance, requiring additional bracing to achieve stability. 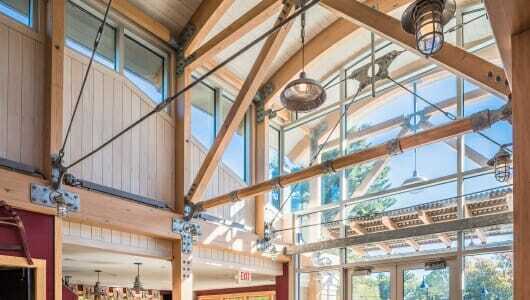 A true, open portal frame can sometimes be achieved with custom glulam beams, as they can have more depth and be continuous at the corners to help resist the rotation. Steel plate joinery is often required to help the glulam resist rotational forces. We often design bents from 24′ up to 48’+, but they can span up to 80′ or so, provided there are sufficient columns and logical load paths. As with all timber construction, spans and member sizes vary greatly with the species of timber, local loading requirements, bent spacing, and type of joinery involved. Hoped this answered your question!